This video title was shot during Erle's instructor's classes. Here, Erle presents for the first time the little known physical side of the Yang Style, no BS, no mystical garbage, just excellent and practical physical stuff on gaining great power for one strike kill methods to all parts of the body. 2/. SP17 Turning Over Fist. 3/. CV14 Turning Over Fist. 4. Lifting Fist to CV14. 5/. Hook to ST5 or SP17 from very close quarters. 6/. All of the above from the 'Drunken Boxing Stances. It's no use learning all of the forms etc., and not knowing how to punch! And it has been our experience that not many people actually know how to punch. 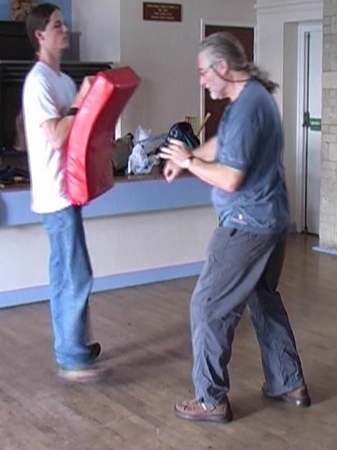 Sure many can line themselves up and break boards, but in the street instantly, they cannot gain the necessary power from only centre metres away to take someone out instantly with one punch. This teaches how to do this.